Wix Chat is an easy way of adding live chat to your Wix website even though it's not as powerful as the best live chat applications. 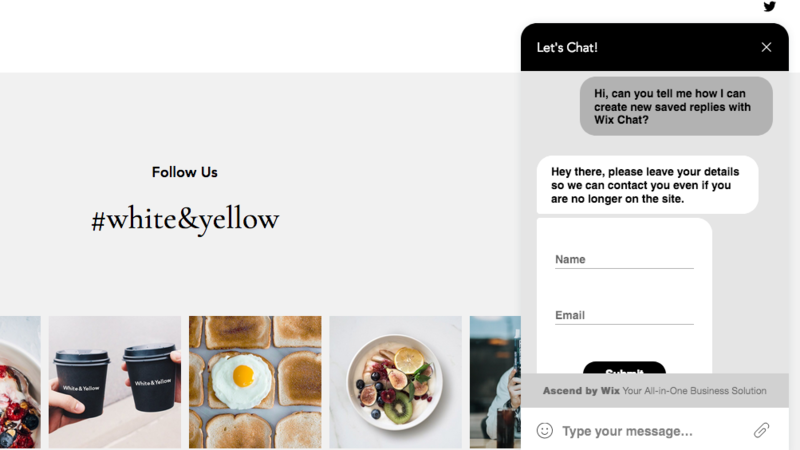 If you have a Wix site, or are considering building one, the easiest way to add live chat to your website is with the included Wix Chat feature, which is what is being reviewed here, rather than Wix as a website builder. It is possible to add other live chat widgets onto a Wix site. Wix lists a number of live chat apps in their App Market including LiveChat and Formilla, but I haven't tested out these integrations yet so don't know how well they work. I have also read about people successfully installing other live chat applications on a Wix website using HTML iFrames or via the Tracking & Analytics feature (only available in some paid plans). I have not tested these options myself yet so your mileage may vary. 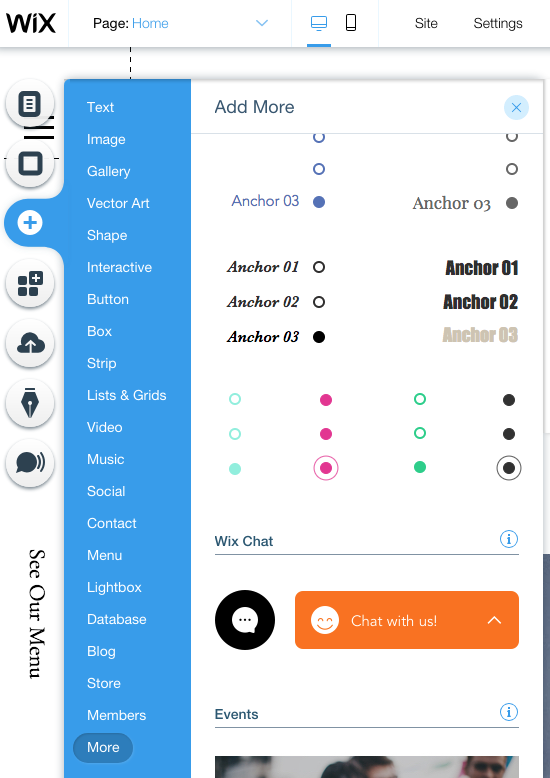 To add Wix Chat feature to your website, go to the editor and select the plus symbol, then click on the Wix Chat icon. From a website visitor's point of view, the chat user experience is good, on both desktop and mobile browsers. 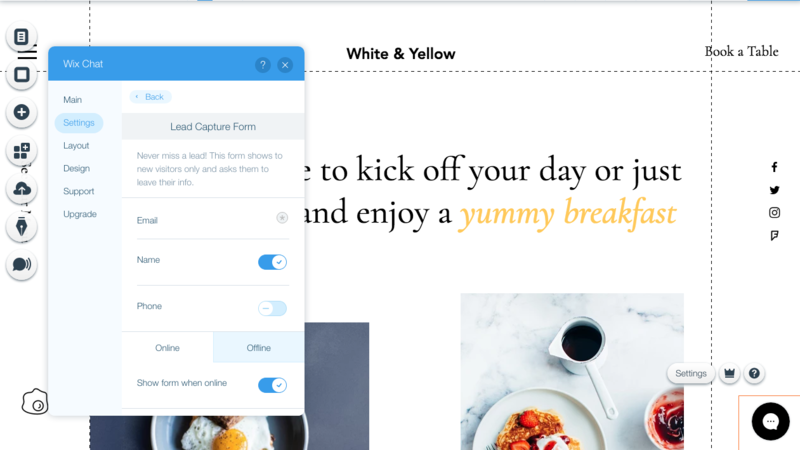 Wix have made the (in my opinion) correct decision to embed lead capture forms into the chat interface itself. This is something which Intercom has pioneered but it's good to see others following suit. The interface for chatting with your website visitors is slightly hidden away. You need to go to the admin area for your site, then select "Customer Management" and go to the Inbox. The chat interface is well laid-out on desktop and in the mobile app. 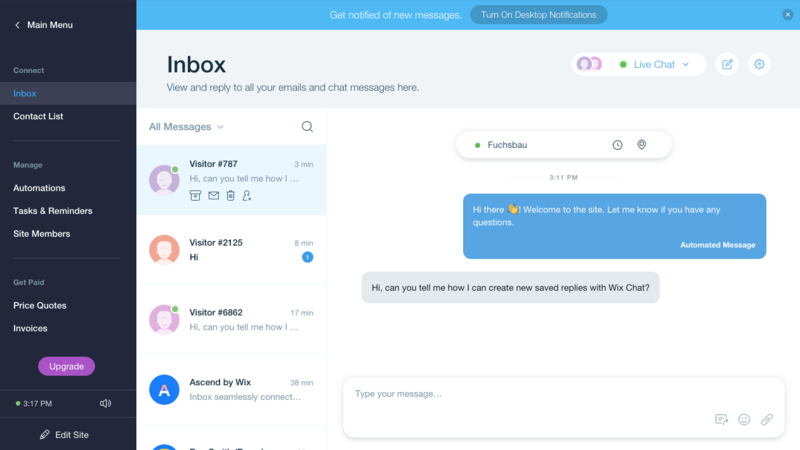 Because Wix hasn't been designed from the ground up as a live chat application, it's certainly worth turning on desktop notifications in order not to miss any chats with your website visitors. Configuring live chat for your site is unfortunately not such a great experience as you have to move between settings on the Inbox screen itself (e.g. managing your saved replies), in the Settings area (e.g. office hours) and in the website editor tool for everything else (e.g. styling the chat box). Live chat can be added for free to a Wix website. However, there are a number of live chat features which can only be accessed when you upgrade to a paid Wix account (see details below). You can set the position of the chat widget and whether it is a bar, or a round icon. You can also configure the color of the chat widget in order that it matches or complements the color of your website. You can add labels for contacts, but not for individual chats. When a visitor contacts you via a contact form, you will see his or her message in the Wix Inbox. When you reply to customers from the Wix Inbox in the free plan, they will receive an email from a Wix domain (e.g. reply@crm.wix.com). 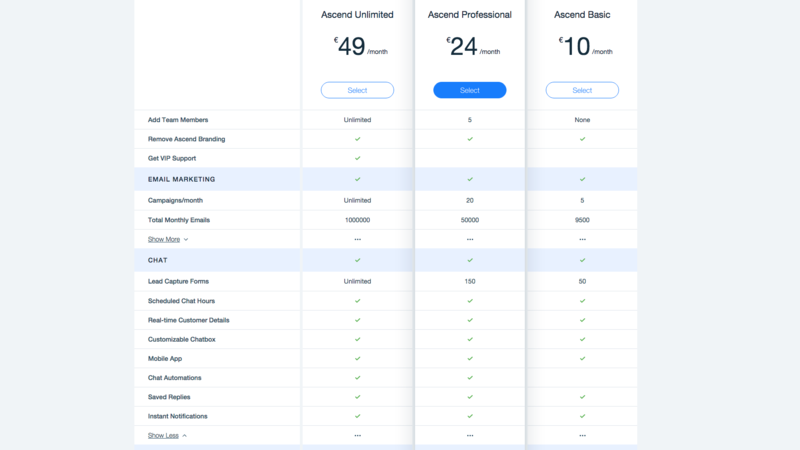 In order to have a custom email address, you need to connect a domain which requires a paid plan. Wix supports DKIM records for authenticating outgoing emails from your domain. Wix also offers an integration with G Suite. You can add visitors with whom you are chatting as contacts. Wix supports basic contact fields out of the box (name, email, address, phone number etc.) but you can also add custom fields (text, number, date and url types are supported). Wix supports email marketing campaigns (paid feature) and the automated pushing of chats via its Automation feature. Wix provides tools which support the right of (EU) visitors to be "forgotten", i.e. to be removed from your databases. However, it is not clear how you can get explicit consent from users when initiating a chat. With Wix Chat you can chat with your customers in any language. The language used for your chat widget's default text is determined by your site's regional settings. You can change this language at any time. Wix offers mobile apps for iOS and Android with which you can chat with your website visitors and much more. Wix offers an API. The wix-crm module can be used to work with your site's contacts. See https://www.wix.com/code/reference/Overview.html for more information. I've developed Live Chat Labs to help businesses like yours find the best software for your needs. My work is supported by affiliate commissions.